People are the only valuable asset of an innovation services company. While reputation, client list, culture, standards and tribal knowledge are also valuable, those all derive from and are maintained by people. Considering how important people are to Atomic Object, it seems crazy, when I think about it, that I don’t have a reliable way of measuring the state of our people. I’ve put more thought and effort into financial and technical measurements than people measurements. We measure things like test coverage, project test status, billable hours and utilization, and we track revenue and profit margin. These are all strongly determined by or related to successful projects and happy clients. And happy clients, in turn, presuming you employ people with the right skills and expertise, derive from content, satisfied, happy employees. This might be the most important thing I should be measuring. So what should I try to measure in people? Contentment? Satisfaction? Fulfillment? Joy? Happiness? — since I’m not sure, I decided to stick with the most general term, which is happiness. Admittedly, measuring happiness of a group of people isn’t straightforward. But suppose I could reliably measure the aggregate happiness of my company. What would it tell me? Would it be reliable? Would it be helpful? If I had a reliable measure, over time, of the aggregate happiness for the company, I believe I’d have a valuable tool to help make and time the implementation of big decisions, and a measure of the impact of significant policies and new initiatives. While the absolute value of my happiness metric would be meaningless, I believe changes of that value over time would be meaningful. Since the metric I’m imagining is an aggregate metric, I would rely on first-hand investigation, conversation, and group discussion to understand the root cause behind the change I was measuring. Part of the job of a company’s leaders is to keep an eye on exogenous forces (clients, the market, technology, the world in general) that may impact the company’s health, or which present a valuable opportunity. These pressures or opportunities from outside the company sometimes require change inside the company. Given that change is generally stressful for people, and the absorption rate for change by any group of people is finite, tracking happiness over time could be very helpful when trying to decide when the introduction of change will be successful or particularly stressful. Strategic initiatives such as new service offerings, major new internal policies, expansion to new markets, or new partnerships, put stress on the company. They may require extra work, or establishing new relationships, or some travel burden. Tracking happiness over time would give me a measure of that stress, when it peaked, and when it receded. I’d like to have a happiness metric to gauge the long-term impact of structural changes like company ownership, changes to our service offering, the kind of clients and projects we take on, or how we schedule and assign projects. I measure happiness of the company now in a very ad-hoc fashion. I watch how people interact after standup. I observe laughter and frowns. I chat casually with probably half the people in our office in any given week. I ask others how they think the company is feeling. I watch how well attended company parties are. I visit with spouses. While these measures are helpful, they are inevitably distorted by sampling error and my own feelings. I could be disciplined about talking to everyone in the company regularly, in a formal fashion. But in a company with 40 or so employees, that would not only take a significant amount of my work week, but it would still be subject to my personal interpretation, relationships, and position. It would be difficult to quantify consistently, and it might be hard to learn the truth, given my role. What if instead I anonymously asked every employee a simple question? I imagine an interface that makes it possible to answer this question on a simple three or maybe five point scale in less than one second. I don’t want people to spend a lot of time thinking, I want them to simply react, as close to unconsciously as possible. I don’t want to ask people to segregate work from personal happiness. I don’t want people trying to average out their feelings over a period of time (e.g. month, quarter or year). I will rely on the aggregation across people and time to make the metric meaningful. I want to make it easy to answer spontaneously; I don’t want people to have to write in order to respond. I’m envisioning something that integrates with our time tracking tool, PunchIt. Since everyone in the company interacts with this tool multiple times per day, it seems like an obvious place from which to sample the population. The image below is my crude mockup for how this might look superimposed on PunchIt. 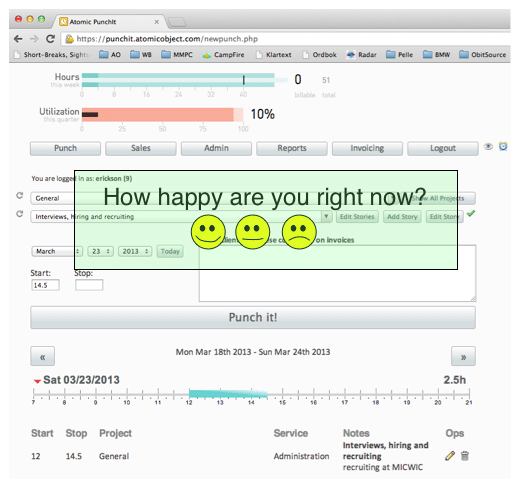 A single mouse click on one of the faces would send the result anonymously, to a web service, dismiss the happiness poll widget, and return focus to PunchIt. My guess is that sampling everybody once or twice a week would be sufficient to capture meaningful data while not making the polling a burden. I believe that varying the time when the polling occurs would both improve the accuracy of the data as well as make it less obtrusive. An immediately obvious measure of happiness is retention. But waiting until you lose people seems dumb. Presumably a significant, sustained, drop in happiness would indicate that we’re at risk of losing talented people. The aggregate measure I’m contemplating wouldn’t tell me who I’m at risk of losing, but it would be a signal that something was up, and that I should investigate. Atomic doesn’t have a retention problem*, but we don’t have a profitability problem either, and I measure that. In my casual research on what other people have done to measure employee happiness, I’ve found companies using net promoter scores, traditional surveys (e.g. 65 statements, 2 open-ended questions), and short interviews or reports. I’ve not found anything as simple as a single question with a spontaneous response. I’m envisioning something on our open office information radiator that charts aggregate happiness over time. Displaying this where everyone can see it would help all of us understand the mood of the office, and know when we should be having conversations about what’s going on. I might see interesting patterns. For example, I might learn that I can time company meetings or important emails (that that have the potential to trigger stress or confusion) for parts of the week where aggregate happiness is higher. Consider the two scenarios below. In the graph on the left, the mood of the company has improved over the long-term average (dashed line). That’s not only nice to know, but might tell me that the change introduced recently has had a positive impact. It might also tell me that the company is mentally able to tackle a new initiative or wrestle with a difficult challenge. In the scenario on the right, the aggregate happiness has decreased markedly and is trending down. I’d be arranging company-wide conversations to find out what’s bothering us, and whether we should be doing something about it. I’d be worried about stress levels and looking for ways to smooth things out and not to introduce new stresses. Two possible, interesting scenarios for the aggregate happiness metric. What I’m proposing is a radically simpler measurement of overall company happiness. It would be a metric that is subject to all sorts of factors (health, traffic, mood, caffeine, personal relationships, clients, bugs, sunshine, colleague interactions, etc); a measure of the whole person. My hope is that it would becomes meaningful and useful as these tiny, easy-to-do, spontaneous samples of personal happiness are aggregated across many individuals over a period of time. I don’t intend to stop gathering anecdotal evidence about the company’s overall happiness. And of course no metric replaces the action of conversations with individuals, groups and the company as a whole. I see my happiness metric as the canary in the coal mine — an early warning about something dangerous in the air. Am I nuts? Do you think tracking this metric over time would provide me meaningful data to gauge the overall emotional state of the company? *In the last five years we’ve had some involuntary turnover, but we’ve only had two people who left because they thought they’d be happier somewhere else. We’ve recently started doing something similar to this but our attempt was to track against our values. We have six value statements and we came up with four declaratives for each value that we are measuring with a standard Likert scale. The resulting 24 question survey takes about 5 minutes to complete at the high end and we are executing it on a quarterly basis. We communicate the results with a standard letter grade for each value and an aggregate grade for the company. Like the measure you are suggesting ours is attempting to quantify something that, at least from first blush, appears to be inherently qualitative. We are acutely aware that it can not replace conversation and in fact have already found that it does the opposite by inspiring valuable conversations that would not have occurred. I like what our survey is doing for us and I like two things about your proposed metric: simplicity and speed. We could never implement our survey on even a weekly basis without it feeling like a burden but I see the canary-value you have described as being significant. Thanks for sharing, Samuel. Your survey sounds very cool. I’m really glad to hear that you’ve found it drives conversation, as well. We should compare notes once we’ve implemented and run our system for a while. They represent different approaches to solving a similar problem. When I read this I thought of an article about customer loyalty. I realize we are taking about employees, but I think there might be some applicable wisdom in it. Thanks for the link. I think there’s a lot of overlap between these ideas, in fact. Drive is one of my favorite books. Very useful to me, and I keep mastery, autonomy and purpose top-of-mind when I’m thinking about how we work. Do you envision this data being tied to a specific user or being anonymous? My thought is if it’s anonymous it could be used to drive town-hall type meetings within the company. If you tied to to specific users you might not get a true representation of what is happening if someone was afraid of being perceived as a “bad apple”. If you were worried that a “Eeyore” might skew the aggregate you could have unique anonymous users to get their baselines. Then once you have the baselines you could determine overall changes up or down to get a better picture… Perhaps this is over thinking it. What I’m thinking of would be anonymous and aggregate. The aggregation smooths out the high degree of variability of taking essentially instantaneous samples. The anonymity removes any hesitation or fear of answering honestly. Your PunchIt solution is also tainted by the fact they’re using PunchIt. I’ve never met anyone who likes their time tracking software. Also, it’s a pretty solid experiment. Measuring things is easier said than done but I’m always reminded of Errol Morris’ excellent documentary (Fog of War) about Robert McNamara in which McNamara recounts 11 lessons from his life. “Get the Data” was one of them. That’s quite inspiring, actually. Thanks. I’m looking now to see if my fellow Atoms share my excitement about the value of measuring aggregate happiness. Good point, Brian. It seems much less bad than interrupting the act of making (development or design). I should validate this, but PunchIt has become such an integral part of life at Atomic, and operates just the way we want it to, that I don’t think people hate it. Hey Carl! How about http://www.gethppy.com – we’ve specifically created it to measure company happiness and let employees provide anonymous feedback. We’re using it for almost a month now and we had a lot of surprises in our company of 25. Would you test it out? Very interesting to learn of, George. I’m checking it out now and will get back to you soon. Thanks. Companies happiness depends on various factors but the main lead aspect for the same always lies in the time management. A better time management always has a good approach related to the company’s happiness. When the time is managed with perfectness, the overall strategy for the measurement of happiness always give a positive go through. To get the happiness in our company we have implemented time tracking software from Replicon – http://www.replicon.com/time-tracking-softwares.aspx which is cloud based with streamlined and helps raise the companies happiness with more respective value as such.